Wash the plums and place them in an ovenproof dish large enough to accommodate them in a single layer. Put all the remaining ingredients (*not the cheese) into a pan, start heating it up and stir until the sugar dissolves bringing it to the boil. Now pour the wine over the plums, cover the dish with a piece of an aluminium foil and put into the oven. Total baking time is 35-40 minutes depending on the firmness and size of the plums. After half of the baking time, turn the peaches so they will bake evenly. 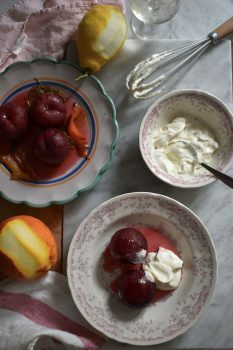 The plums should just be soft but keeping their shape and the wine will have reduced by then and turned into a sweet thick liquid that you can just spoon over the plums. Serve warm.